There are three theoretical rules for archways in Mooseys Country Garden - a reason to walk under them, interesting plants (inevitably a climbing rose) growing over them, and a clear path with lots of room underneath - no scratchy contact, please. These may make good gardening sense, but in my garden the third rule gets broken quite a lot. And, despite my best efforts, the interesting plant I'm determined is going to cover an archway can get the sulks, or worse. Did I mention that it's nearly always a rose? 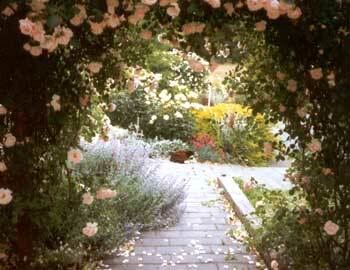 Archways in my garden have to be sturdily built and dug in well, to hold up in the wind. So when am I going to branch out and plant a climber that isn't a rose? The Pond Paddock archway forms the entrance to the Pond Paddock from the house lawn. An original sheep fence joins it on either side. This archway has never been exploited to the full by its roses, so I'm now giving a Clematis Montana a try. Eek! More archways - that means more roses! Thirteen metal archways sit in a row leading deep into the middle of the Hazelnut Orchard. The roses which adorn them have been growing now for a few years. A narrow grass path joins the house lawn and the driveway lawn, and a natural archway of green has formed over the gap. I've placed a rather rickety green arch in there to provide a little help for the roses and the small Crab-apple Tree living either side of the gap. For me, archways equal roses. A major gardening confession - I have little imagination or confidence to grow anything else over the arches in the garden. When I moved here back in 1995 I was in my rose phase, and I brought many roses with me from my previous garden. Two of the roses were New Dawns, which I'd read were strong and healthy, with shiny green leaves.